Senior Railcard discount code 2019: £20 OFF 3-year and 10% OFF 1-year exclusive online offers. Senior Railcard holders for over 60s enjoy 1/3 OFF train tickets in Britain. SAVE £357* and more with unlimited savings on rail journeys. Save online with the latest deals, discounts, promotions and offers! This is just one of the many ways that you can save money with Railcards in Britain. Start saving today and never pay full fare in 2019 and beyond. Who can apply for a Senior Railcard? How much do I get off train travel with a Senior Railcard? When can I use a Senior Railcard? What are the Senior Railcard restrictions? How much does the Senior Railcard cost? 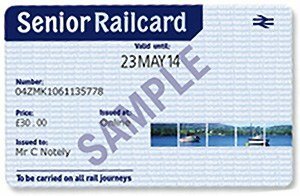 Where to buy a Senior Railcard? How to renew a Senior Railcard? Senior Railcard holders get 1/3 OFF discount on train fares in Britain. You’ll need to be 60 years or over to qualify. Get the latest Senior Railcard offers and start saving today! As well as savings on train fares and discount code offers, there’s also partner deals. Save money in 2019 on holidays, days out, attractions and gifts. And get cheap deals on tickets to theatre, events, exhibitions and shows throughout Britain. 75% OFF YHA Membership and pay just £5! Get money off the card itself with Senior Railcard discount code offers. To get yourself a Senior Railcard for 2019, you must be aged 60 or over. It’s really as simple as that. There a few things you’ll need to apply (like proof of age) and there are some restrictions, but we’ll fill you in on those below. Avoid paying full price for train travel and rack up the savings with a 2019 Senior Railcard. Get 1/3 OFF standard and first class rail fares throughout Britain for a year with a one-year Railcard. For example, if you wanted to travel from Sheffield to London to visit the grandchildren using an off-peak return you would have to fork out £67.50, but with your Senior Railcard you can knock off £22.95 and go visit the capital for £44.55! Remember to use your one-year Senior Railcard discount code to get another 10% OFF the cost of the card itself. Now wouldn’t that be a lovely way save some money in 2019 and beyond? Take full advantage of your Senior Railcard and start making the maximum savings when booking your rail travel. Here’s how to enjoy 1/3 OFF the price of all these train tickets valid across the National Rail Network in Britain for the next 12 months, or three years. Oyster Off-Peak pay as you go Daily Price Cap and Off-Peak pay as you go single fares for journeys on National Rail, London Underground and Docklands Light Railway. What restrictions are there on the Senior Railcard? There are a few time restrictions to bear in mind with your Senior Railcard in 2019. They won’t be valid for your season tickets and you won’t be able to use your Railcard for the discount during the morning rush hour Monday to Friday. This is for journeys made within the London and South East. However, the times of the off-peak (discounted) services do vary so it’s best to check when you book your tickets. How much does a Senior Railcard cost? The Senior Railcard usually costs £30 for the year, however, you can get 10% off with a 2019 Senior Railcard discount code. With the online promotion applied, this brings the cost down to £27. With three-year Railcards, you get a bigger online exclusive saving of £20 (22% OFF). Instead of paying £90 (the cost of three Railcards at full price every year) you get it for just £70. Prices are bound to go up so it is likely you will end up paying even more for three one-year Railcards. SAVE £20 on a three-year Senior Railcard today with this online exclusive offer. No promotional code is required for this deal. It’s really easy to get hold of a Senior Railcard and there are plenty of ways to do it. You can also get 10% OFF online discount with the 2019 Senior Railcard promotional code listed below. Don’t forget to apply your 10% OFF Senior Railcard promotional code when you buy online! To save some time, you can fill out the application form before you go. Just remember, however, that you’ll only get savings and discounts when you buy Railcards online. Ready to start saving 1/3 on your rail travel? How about an extra 10% OFF with this online exclusive 2019 one-year Senior Railcard discount? It’s really simple to renew your Senior Railcard online within 30 days before the expiry date runs out. You’ll get a handy email reminder so you don’t miss out on those savings. Even if you bought it at a train station or over the phone, you’ll still be able to renew it online. Just make sure you register it online beforehand. Find out more about the Senior Railcard on the official website. Remember to use your 10% OFF discount this 2019 with a Senior Railcard discount code.